Enable browser notifications to stay up to date with all the Alpha Universe Updates! Create your profile to get all your Alpha Program notifications in one convenient location. Password* Must contain at least 8 characters, an uppercase character, a lowercase character, and a number. No symbols or special characters allowed. Yes, I'd like to receive emails from Sony, including the Alpha Universe newsletter, camera announcements, product deals and more. Are you a student or educator? What kind of camera(s) do you shoot with? Since starting photography, road trips have been my favorite way to travel around and take photos. One trip I recently planned was from Seattle to Whistler, and I invited some friends to join me. We arrived in Seattle at 1:00 a.m., and my plan was to see as much as we could while we were there. My friends and I grabbed a quick bite at Denny’s and hit the road to head straight to the beautiful North Cascade National Park, just in time for sunrise. As we pulled into the campground parking lot, I was the first one to jump out of the car and run through the trees to the fishing dock. 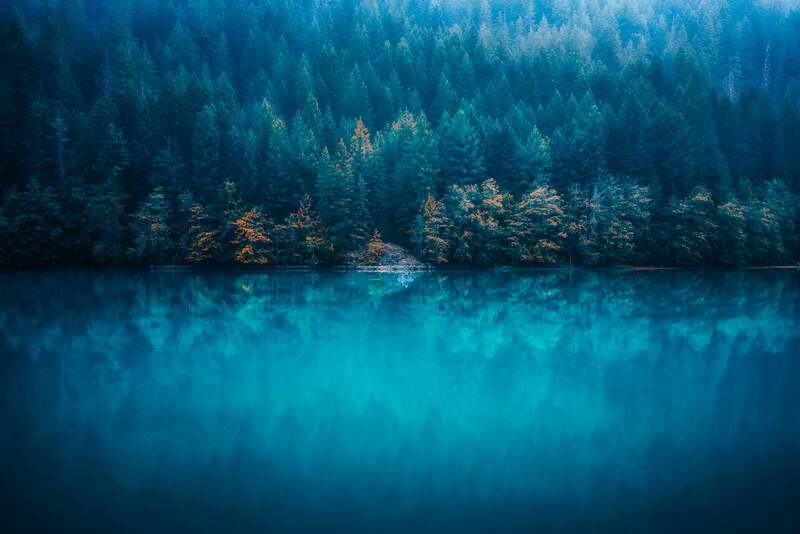 I was greeted with a stunning reflection of alpine trees in the baby blue water. It took me a minute to realize that what was in front of me was real. I ran back to the car in excitement, grabbed my camera bag and rushed my friends Talha, Danny, Basil and Selina to come see this view. I looked to the right and saw that there were many layers to the reflection. It was absolutely beautiful, but I felt it was missing something. It was missing an object to really magnify the scale of this place. I ran down the side of the water below the dock, and there was my dream framing. A perfect mountain in the middle with layers of alpine trees on both sides reflecting on the water. I insisted my friends Danny and Basil to backflip in while I captured it. Basil touched the water and it was absolutely freezing. He wanted to warm up his body before the jump, so he started doing push-ups and jumping jacks. While they were getting ready, I played around with my camera and fired some test shots. Basil even had the heater on in the car at the parking lot because it was that cold. 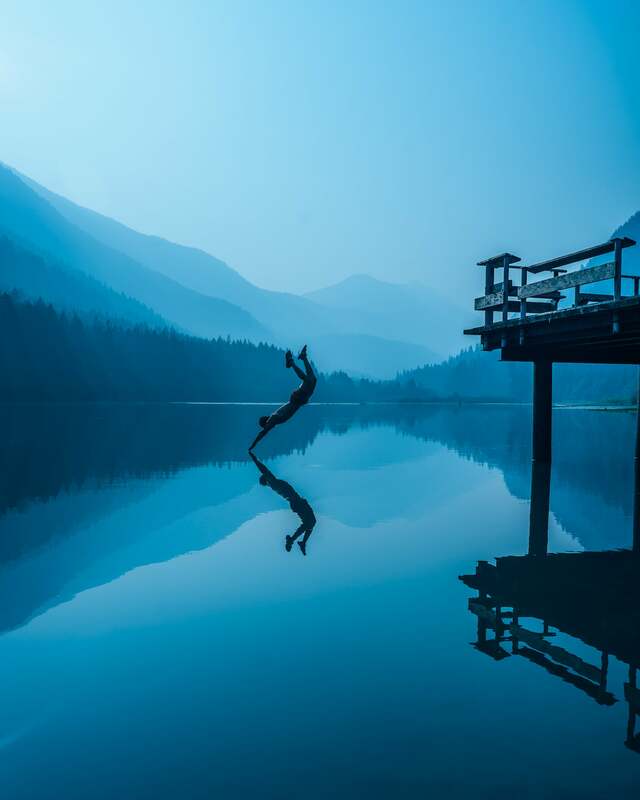 He stood on the edge of the dock and stared at the water for a good minute, trying to see if the water would be deep enough for him to safely jump. Meanwhile, I stood on the rocks in the water with my finger on the shutter button, ready to fire. I set my Sony α7R III to High Burst Mode and at 10 FPS, with the AF set on Basil. The camera was set at 1/640-sec. with the ISO at 50 and the lens at f/6.3. I wanted my shutter to be fast so I could freeze the motion. My goal was to capture every moment of the jump in focus. After a while, Basil was finally ready to go for it. He did a backflip so effortlessly and it happened so quickly that I didn’t even really realize he had done it until he was already submerged in the water. Shooting at 10 FPS with the α7R III, I captured the full jump in a series of frames. The images came out sharp and the reflection looked great, but I just wasn’t quite satisfied with it. I wanted to align my subject and his reflection in the middle with the mountains in the background. 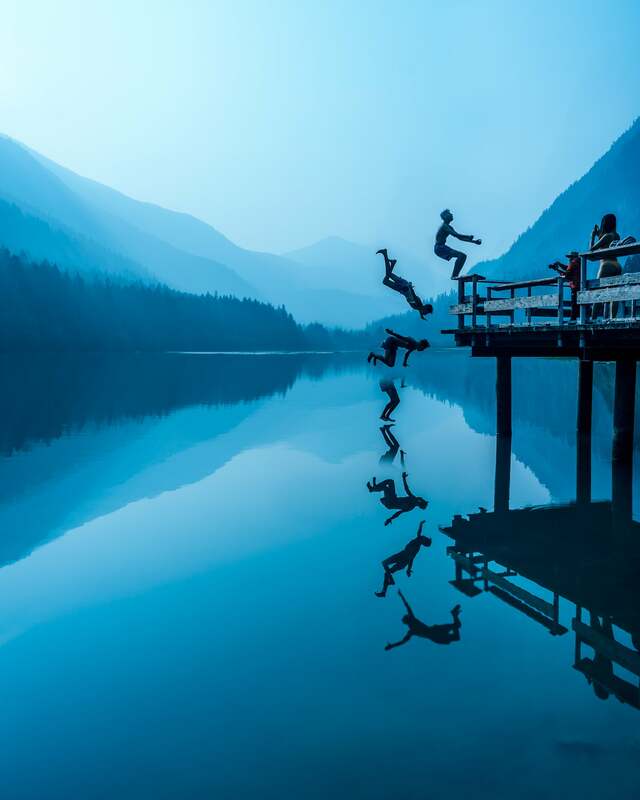 In order to do that, I would need him to jump again, and this time further out into the lake. After Basil did his jump he immediately got out of the water and said he could barely touch the bottom. Though the water was freezing, he described how refreshing it felt and urged Danny to dive in next. We waited for the lake to be still and for the reflection to come back. Then Danny got on the top of the railing, still wearing his sandals, and quickly jumped right into the lake. The moment before he touched water was captured beautifully by my camera. This might be the best photo I’ve ever taken. We had such a great time together on this trip. I am glad to be able to capture our memories through photography and to share them with others. I hope these photos display our beautiful planet and that they inspire others to get outside more! Did you like what you just read? Take a minute and share this story with your friends. Universe is here for the makers, the doers, the people who dream in colors. You bring your curiosity and ideas, we’ll provide the knowledge, the inspiration, and the state-of-the-art imaging tech to help you make dreams reality. © 2019 Sony Electronics Inc. All Rights Reserved.